Authors should get ORCID ID (https://orcid.org/register) before submitting their manuscripts. The entire editorial workflow is performed using the Dergipark Online Manuscript Tracking System. Once a manuscript is submitted, it is assessed by the editor for suitability for the journal. Papers deemed suitable will be peer-reviewed by at least two reviewers. As part of the submission process, authors are required to check off their submission’s compliance with all of the following items, and submissions may be returned to authors that do not adhere to these guidelines. Please read and follow these instructions carefully; doing so will ensure that the publication of your manuscript is as rapid and efficient as possible. The Publisher reserves the right to return manuscripts that are not prepared in accordance with these instructions. - The complete manuscript should contain full text, figures, tables and references. MS word document with file extension ".doc" or ".docx" is preferred. - All manuscripts will be peer-reviewed by at least two referees. - Manuscripts should be typed single-spaced on A4 size paper in Times New Roman, with 20 mm margins including references, table titles and figure captions. Abstract font size should be 9pt. Font size should be 9pt. Three to six key words should be listed below the abstract. Tables and Figures should be cited in the text and they should follow the text; see below for details. - All references should be cited in the text, and vice versa. - References should be prepared according to APA Style. - References in languages other than English must be referred to by an English translation (with the original language indicated in parentheses). Ackerman, D., Weisberg, S.B. (2003). Relationship between rainfall and beach bacterial concentrations on Santa Monica Bay Beaches. Journal of Water Health, 1(2), 85-90. Cupples, A.M., Xagorarki, I., Rose, J. (2010). New molecular methods for detection of woterbone pathogens. In: Mitchell, R., Gu, J.D. (Eds. ), Environmental Microbiology (pp. 150-211), New ﻿Jersey, NJ: Wiley-Blackwell. Hagedorn, C., Blanch, A.R., Harwood, V.J. (2011). Microbial Source Tracking: Methods, Applications, and Case Studies. London: Springer. Zeki, S. (2012). Assessing microbial water quality by membrane filtration and quantitative polymerase chain reaction (qPCR) methods at Golden Horn (PhD thesis). Istanbul University, Istanbul, Turkey. Number tables consecutively in Arabic numerals (1, 2, 3, ...). Title of the table should be written on top of the table. Descriptions about table items should be placed at the bottom of the table with an asterisk. 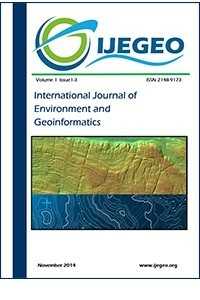 All IJEGEO articles are published with open access under the CC-BY Creative Commons attribution license (the current version is CC-BY, version 4.0 http://creativecommons.org/licenses/by/4.0/). This means that the author(s) retain copyright, but the content is free to download, distribute and adapt for commercial or non-commercial purposes, given appropriate attribution to the original article. Attribution — You must give appropriate credit, provide a link to the licence, and indicate if changes were made. You may do so in any reasonable manner, but not in any way that suggests the licenser endorses you or your use. No additional restrictions — You may not apply legal terms or technological measures that legally restrict others from doing anything the licence permits.